Immunity, in general, can be defined as resistance to infectious disease brought about by the collection of our body cells, tissues, and molecules which together form the immune system. The physiologic function of our immune system is to protect us from infections and subsequently eradicate existing infections. It is through this that we need to take careful consideration of our immune health by observing certain foods and dietary habits. This article aims to analyze the importance of a particular group of organisms, Fungi which enhance our immune system. As mentioned earlier, fungi importance in immune health is clearly evident by the use of medicinal mushrooms as dietary supplements. For over 2000 years, mushrooms have been well documented in the Far East Countries like Ancient China and Japan on their part in promoting better health and boost immune functions. Certain organic mushrooms with their large number of bioactive molecules have shown, in clinical studies, the ability to treat a broad range of immune deficiencies and other conditions like fatigue, insulin resistance, and cancer. There exist different strains of mushrooms with their unique properties. However, only selective of these have proven beneficial to our bodies. As such, Mushroom Remedy has carefully considered their strains, cultured them to desired concentrations and ultimately extracted these components via different extraction techniques available. 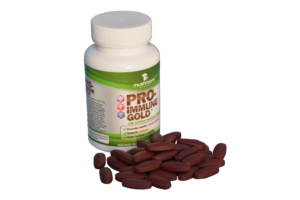 PRO-IMMUNE GOLD from Mushroom Remedy is a dietary supplement that promotes better immune health and boosts immune function. We designed this product with the knowledge of these mushrooms and their medicinal properties. This product improves the quality of life in general promoting well-being. Designed specifically for immune health, PRO-IMMUNE GOLD is a combination of the most potent strains of Coriolus versicolor and Ganoderma lucidum. Both of which contain the critical components polysaccharide peptide (PSP) and polysaccharide-K (PSK) and other polysaccharides, triterpenoids, and ganoderic acids. A blend of these biological components are responsible for maintenance of our immune health and further boosting its potency. Ganoderma lucidum also known as Reishi mushroom had some bioactive molecules. Ancient physicians described this mushroom as the Immortality Mushroom. According to some research studies, Reishi can help treat insulin resistance to immune deficiencies. Supplementation of the regular diet with reishi mushroom improves the sense of well-being, protects DNA from oxidative damage from radicals (which is a major contributing factor to aging). Also regulates blood sugar levels, balances and maintains the immune system, protects the kidney, and exhibit anti-cancer properties. The PRO-IMMUNE GOLD product promotes better immune health, supports longevity and also maintains overall wellness. Mushroom Remedy manufactures all its products, including PRO-IMMUNE GOLD, according to FDA approved standards in a CGMP facility. This product is also affordable in pricing and 100% safe with no allergens. Mushroom Remedy prides itself in researching on immune health and producing healthy products for the benefit of life longevity.